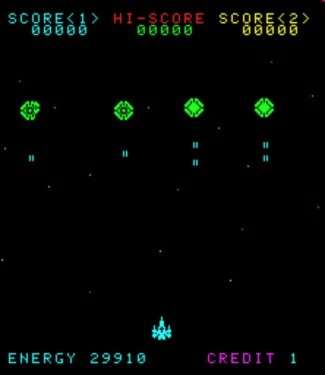 A great and pioneer fixed vertical space shoot’em up game. The Ozma wars has begun, and the player controls a spacecraft which must fend off UFOs, spaceships meteors, and comets in a varied of space levels. Instead of lives, the player is given an energy reserve that is constantly diminishing; getting hit by the enemy causes gameplay to stop momentarily and a large amount of energy is depleted. Every so often, a mothership will appear and dock with the player’s spacecraft, allowing the energy to be refilled. There are 3-4 recognizable stages as the game progresses and new enemies begin to appear. After these, the mothership will appear, and the cycle starts over; this continues indefinitely until the energy reaches zero.